There’s a new WordPress book doing the rounds, aimed at serious bloggers who are either using WordPress to promote their business, or trying to make an income directly from blogging. ‘WordPress 3 for Business Bloggers‘, written by Paul Thewlis, has been released in both eBook and ‘dead tree format’ by Packt Publishing. At first glance, this is a pretty impressive effort. The content is well-written and easy to follow, and the book offers a comprehensive overview of business blogging on the WordPress platform. Recommended reading for anyone who’s wants to launch a commercial blog, or expand on their current blogging efforts and find new focus. A Blog Less Ordinary — What Makes a Great Blog? This book is more about business blogging that it is about WordPress. A lot of the stuff covered here could be applied to any blogging platform – WordPress is just the recommended tool. While it’s assumed that readers already know how to use WordPress at a functional level, the book never strays too far into geek-territory, making it suitable for WP novices as well as more advanced users. 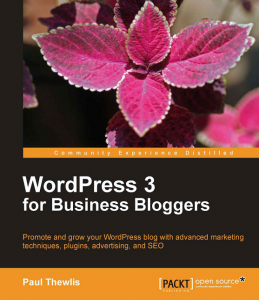 You can purchase ‘WordPress 3 For Business Bloggers’ directly at the Packt Publishing website, or through Amazon. The prices are currently listed as $44.99 for the paperback and $16.49 for the eBook/Kindle edition. Packt Publishing have kindly supplied us with three copies of the eBook, to dispense with as we see fit. So let’s make this sporting. For your chance to win a free copy of ‘WordPress 3 For Business Bloggers’, leave a comment below this article and tell us what your favorite WordPress books are. Tell us which publications, whether paper or electronic, have helped you along in your WordPress journey. Make it a list of titles, as long or as short as you want. For every book that you mention, please add a couple of sentences and tell us why you would recommend it. We’ll pick the three best responses at the end of the week, and each author will receive a copy of the eBook, courtesy of Packt Publishing.